It is important to know the difference between a travel wheelchair and a regular wheelchair as the two are quite different from each other. These two types of wheelchairs both have their own specific uses and should not be replaced with one another. 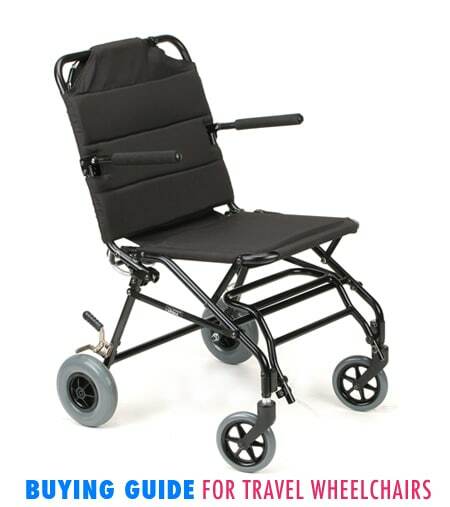 Unlike its counterpart, travel wheelchairs are very compact and lightweight making them ideal for transportation. They are also very durable and adaptable to their environment. Travel wheelchairs have the ability to fold up in ways that other wheelchairs cannot, making them much easier to store. When it comes to transportation, travel wheelchairs are much easier to lift into buses or cars, which in return makes them an ideal choice for anyone looking into travel. What a travel wheelchair is not however, is a replacement for your manual wheelchair. As stated before, they are not a replacement for you primary source of mobility. Two additional factors to consider for your wheelchair is the leg and foot rest. The differences of these two things are exactly as simple as they seem. A foot rest is designed to support your feet and ankles whereas a leg rest, you guessed it—is designed to support your entire leg. Foot and leg rests aren’t required for everyone so it’s best to consult with your doctor to see if one is recommended for you.